Amyloid-β, TDP-43, huntingtin, and indeed many other proteins linked to neurodegeneration have one thing in common—they aggregate. And those aggregates, whatever their makeup, seem to share another characteristic according to a paper in the December 3 Science online—they all interfere with transport between the nucleus and cytoplasm. Researchers at the Max Planck Institute of Biochemistry in Martinsried, Germany, discovered the phenomenon when studying aggregation of both natural and artificial proteins. “I believe [this] is a general mechanism behind the different diseases associated with protein aggregation,” co-senior author Mark Hipp told Alzforum. 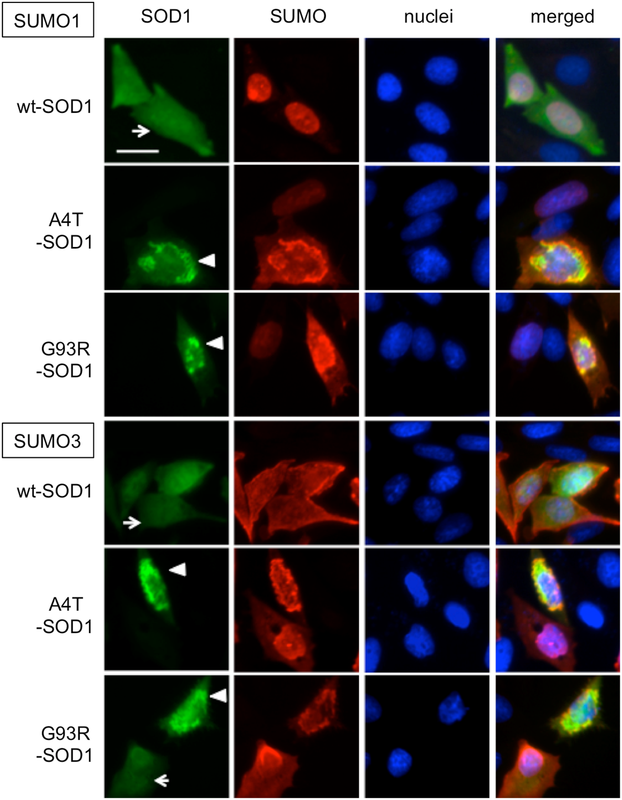 Earlier this year, scientists discovered that hexanucleotide repeats in the C9ORF72 gene, which cause amyotrophic lateral sclerosis and frontotemporal dementia, interfere with traffic across the nuclear pore, perhaps due to abnormal polydipeptide aggregates encoded by the expansion (see Aug 2015 news). The RNA-binding protein TDP-43, which normally shuttles back and forth between nucleus and cytoplasm, also aggregates in ALS and becomes trapped in the cytoplasm (see Jan 2010 news; Feb 2014 news). In Alzheimer’s too, nucleocytoplasmic transport falters, while in Huntington’s disease, huntingtin aggregates disrupt the nuclear envelope, hinting that they might interfere with traffic as well (Liu et al., 2015; Mastroeni et al., 2013). Hipp and co-senior author Ulrich Hartl wondered if amyloidogenic proteins affect nucleocytoplasmic transport in similar ways, and if the cellular location of those aggregates was important. To address these questions, first author Andreas Woerner and colleagues started with artificial proteins that form β-sheets and fibrillar aggregates (West et al., 1999; Olzscha et al., 2011). Called β17 and β23, these lacked repetitive sequences that might also contribute to their toxicity, but did aggregate in the cytoplasm and nucleus of a kidney cell line. To restrict their whereabouts, the authors attached nuclear localization and nuclear export sequences. The aggregates were more toxic in the cytoplasm than the nucleus. Furthermore, cytoplasmic aggregates recruited and sequestered nuclear pore members and transport factors. In so doing, the aggregates altered nucleocytoplasmic transport. A green fluorescent protein tagged with nuclear import and export signals tended to get stuck in the nucleus. Similarly, the naturally aggregating polyglutamine expansion from huntingtin prevented GFP trafficking. Cytoplasmic β17 or β23, huntingtin, or a cytoplasmic fragment of TDP-43 blocked export of messenger RNA as well (see image above). Aggregates also interfered with mRNA transport in neuronal cultures. “Protein aggregates in the cytoplasm, but not in the nucleus, inhibit transport of proteins and mRNA across the nuclear envelope,” concluded Hipp. However, that does not mean reduced nucleocytoplasmic transport is necessarily the primary toxicity in various kinds of neurodegeneration, he said. Other factors such as repetitive sequences or loss of soluble protein could still contribute. However, Hipp suggests that altered nucleocytoplasmic traffic could be a common characteristic of neurodegenerative diseases that might be amenable to treatment. Scientists are already investigating small molecules that affect nucleocytoplasmic transport, normalizing protein levels inside and outside the nucleus (see Aug 2015 news). Woerner AC, Frottin F, Hornburg D, Feng LR, Meissner F, Patra M, Tatzelt J, Mann M, Winklhofer KF, Hartl FU, Hipp MS. Cytoplasmic protein aggregates interfere with nucleocytoplasmic transport of protein and RNA. Science. 2016 Jan 8;351(6269):173-6. Epub 2015 Dec 3. [PubMed].